Show that the present isn’t working: Allow a crisis to happen, publicize poor results, force encounters with unhappy customers, publicize lost opportunities. Change the metrics: Create performance targets that are high enough and/or broad enough they can’t be reached with business-as-usual. These tactics to increase urgency all work by fostering discomfort with the present. A client found himself spending inordinate lengths of time evaluating opportunities and procrastinating a decision on which ones to pursue. When I showed him how his lengthy decision process was limiting the number and quality of opportunities that presented themselves, he realized that he could grow his business significantly by streamlining this process. He saw the urgency of addressing the issue, we worked together to fix it, and his business has grown threefold since. 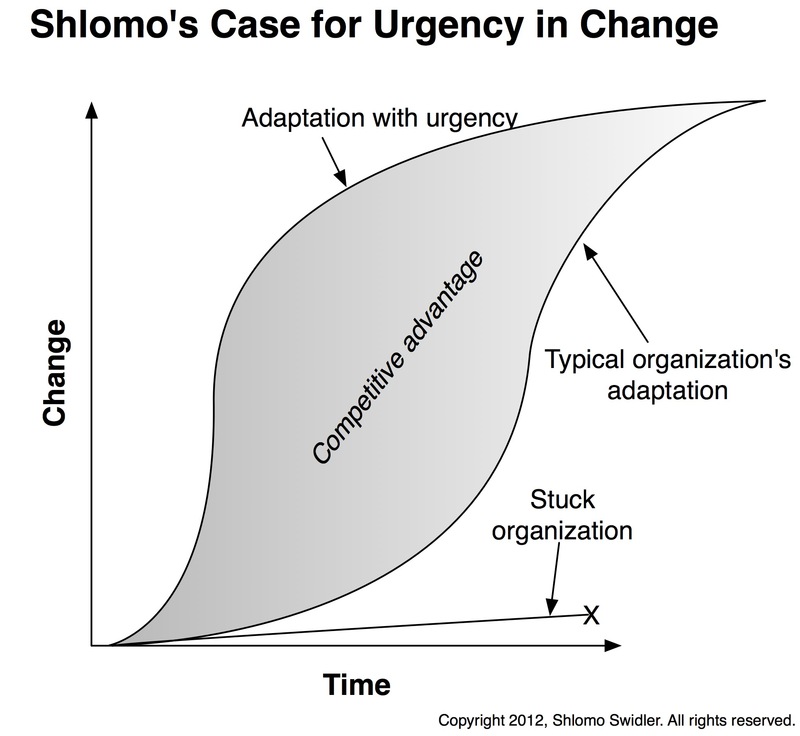 Creating a sense of urgency is the first step in a successful change program. Kotter describes further steps to a successful change effort, but urgency underlies them all. Next post: Where is the value?